In a parking lot, you are standing next to your car rear with your arms full of shopping bags, all set to open the car trunk. You insert the key or use your remote trunk opener, but the lock won’t turn. A few minutes later, all the shopping bags are on the ground, and you are frantically trying to open the trunk. You use your full physical strength, but it still does not open. When you find yourself in “can’t-open-car-trunk” situation, the first thing you need to do is take a deep breath and think clearly. Figure out why you can’t open it. You cannot get out of the situation until and unless you know the reason. Locked the keys in the trunk: You may have accidentally locked the keys in your car trunk. Damaged lock: You can’t open the lock probably because it is jammed, the lock mechanism is damaged, or the lock is worn out. Key fob issue: Your electronic fob is not working. Broken keys: You probably have inserted a broken key into the trunk latch slot. Wrong key: You were in a hurry and brought with you the keys of another car as well, and are using that key to open the trunk. Now that you have zeroed in on the reason, it will be easier for you to find a solution. You can fix some of the issues by yourself, but for others, you may have to seek the help of an auto locksmith. If it is the case of the wrong key, you can very well find the right key in your pocket. However, when your key is locked in the trunk, you may or may not be able to access the trunk on your own. The locked trunk does not necessarily mean your car doors are locked as well. If your car’s front door is open, you can get inside and push a button or pull a lever on the dashboard or located in the front seat area to open the trunk. 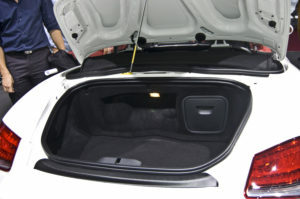 In case, you cannot use the trunk open mechanism located in the front seat, access the trunk through the backseat. However, you cannot fold the backseats forward in all the car models. In such a scenario, as well as when all the doors of the car are locked, and you cannot call for a spare key, it is best to call a skilled auto locksmith for help. You cannot be standing in the parking lot the whole day, trying to figure out the ways to unlock the trunk. And, you cannot fix damaged lock, broken keys, key fob issue, or worn out locks. Only a professional locksmith can do that for you. They will unlock the trunk and fix the key and lock issues in no time at all. Soon, you will be driving to your destination, with shopping bags in your car trunk. Need an auto locksmith in Racine to help you unlock your car trunk? Call Racine’s Lock & Key at (262) 509-0366 for all kinds of car key and lock problems.